Observers may be puzzled as to why we have taken our campaign to Savills. Well, Savills are the both listed as Development Manager and Planning Consultant for the Felnex development , just across the road from the planned Beddington incinerator. There is a memorandum of understanding that the excess heat from the incinerator will be piped to heat these homes. As our letter explains (see below), campaigners are given to understand that the developers never wanted this heat. The marketing of the Felnex Development makes no reference to this piped heat from the incinerator. Yet, this theoretical understanding allows Viridor to justify inappropriate development on metropolitan open land, analogous with green belt, because such developments should only be approved in “very special circumstances”. Determining whether the “very special circumstances” test has passed has always been a key argument of the judicial review claim. We had requested a meeting to discuss the matter with Savills head office but after failing to get a reply, we were forced to take direct action. Watch what happened when the letter was hand in at the local Savills office. We also recommend reading the dirty truth behind how Felnex got lumbered with expensive heating they don’t even need. See here for how the press reported it. It is with regret that we have felt it necessary to resort to a demonstration in order to hopefully get your attention. I have personally contacted Mr Armitage Hobbs (Head Office 33 Margaret Street) twice, as has London Borough of Merton Councillor David Dean (Conservative), in an attempt to arrange a meeting with Schroders and Savills with regard to the Felnex development in Hackbridge. 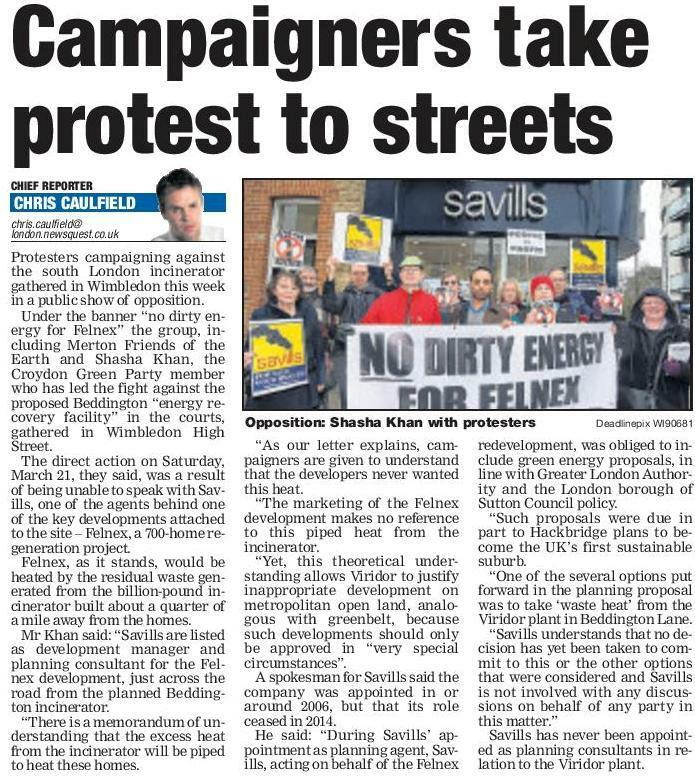 Savills have an excellent reputation and we are surprised to see your company associated with the unpopular Beddington waste incinerator. As you know a memorandum of understanding exists to, in theory, pipe excess heat created by the Beddington incinerator to the Felnex development in Hackbridge. We understand that there was never a need for the Felnex mixed use development to secure delivery of any additional heat from a local district network as the planned buildings are already designed to be highly energy efficient. What is more, we have it on good authority from a source at Sutton council, that the cost per unit for the end user will be 30 per cent to 50 per cent higher than the market rate. Additionally, it is almost inconceivable that housing marketed as being the flagship of Sustainable Hackbridge, the UK’s first sustainable suburb, will be desirable to potential homeowners once they realise that their own recyclables are being incinerated in a development just across the road, with all the health risks from ultrafine particles this entails. Once again, it is unfortunate that this demonstration has had to take place but I urge you to get in touch with us so that we can discuss the Felnex development in person with you. Thank you for your letter dated 21 March 2015. We can confirm that Savills was appointed in 2006 as planning agent and development manager for the Felnex redevelopment in Hackbridge. Savills’ appointment as development manager on the Felnex redevelopment ceased in early 2014. 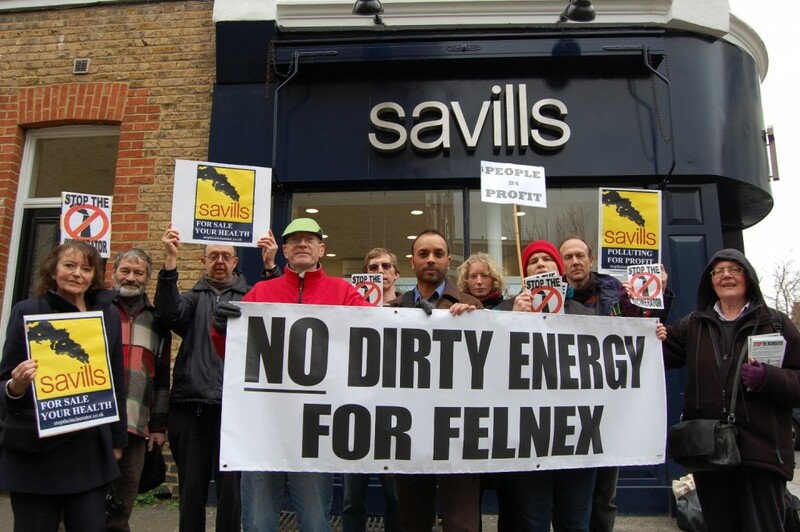 During Savills’ appointment as planning agent, Savills, acting on behalf of the Felnex redevelopment, was obliged to include green energy proposals, in line with Greater London Authority and the London Borough of Sutton Council policy. Such proposals were due in part to Hackbridge plans to become the UK’s first sustainable suburb. One of the several options put forward in the planning proposal was to take ‘waste heat’ from the Viridor plant on Beddington Lane. Savills understands that no decision has yet been taken to commit to this or the other options that were considered but as Savills is not involved with any discussions on behalf of any party in this matter we cannot confirm this. Outline planning permission on the Felnex redevelopment was obtained in March 2012. Savills has not been and never has been appointed as planning consultants in relation to the Viridor plant on Beddington Lane. We understand that Viridor was granted planning permission for an Energy Recovery Facility in March 2014, however, as Savills had no involvement in that planning application, we cannot comment on the need for or scale of the proposal.